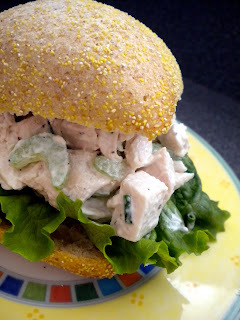 I was in the mood for a chicken salad sandwich from the deli today; the kind of sandwich with at least ½ pound of gloppy, mayonnaise-laden chicken salad on top of a huge Kaiser roll. Yum. Too bad delis serve sandwiches that have enough calories to last the whole day! No one needs to be eating that much mayo, ever. I threw together this Chicken Salad over the weekend. I tried substituting half the mayo for plain fat-free yogurt. The result was pretty surprising. It still tasted like creamy chicken salad and you’re eliminating ½ the fat. I’d like to give it a try again with fat-free Greek yogurt. Greek yogurt is even thicker and creamier than regular yogurt and it has a really tangy taste that might work well. While we’re on the subject of mayo, I’d like to point out that I always use regular mayonnaise. Hellmann’s. Don’t go crazy and try out Miracle Whip. Just don’t. If you read the back of real mayo, you’ll see the usual culprits in the ingredient list; oil, eggs, vinegar, salt, etc. Ever flip over to the back of the light mayo jar? Chemicals, chemicals and more chemicals. The light alternative does cut the overall calories in half but it uses a lot of artificial ingredients as thickeners to counteract the loss of calories. No thanks. Plus I think it tastes very strange, super sweet and gelatinous. Bleh! I scooped the salad onto a whole wheat Ciabatta roll. You could certainly have it over a bed of lettuce instead. Next time I’ll be sure to cut the chicken and celery a little smaller. I ended up with half the sandwich on my lap from all the filling falling out. Overall a tasty knockoff of the original worth giving a try. I really enjoyed the chicken salad as chunky as it was. I think possibly using a whole wheat pita pocket might help with keeping things tidy. Really good idea. It was very tasty, but a little sloppy. That would do the trick!